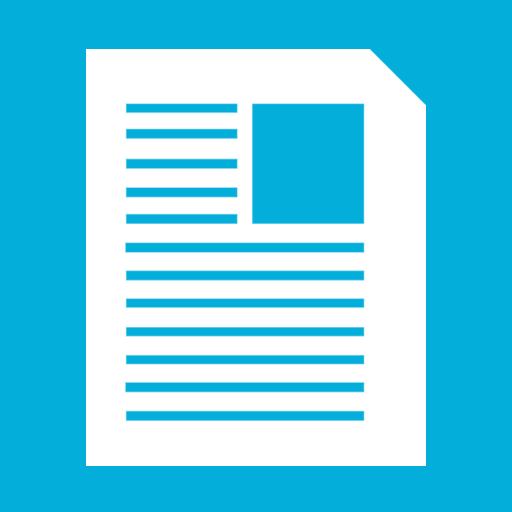 For my historical authenticity within crypto, I encourage you to read through my posts/history on Bitcointalk (link above). It faithfully serves as a record of my social actions and what I actively accomplish within the crypto community; this comes from a place of genuine passion for this industry. Coin Trader‘s Evolution (CTE) Advisor was founded from the ashes of the first altcoin information site, Coins Source Inc (2013-2015), which innovated and transformed the crypto space entirely. There were many leftover pieces, contacts and ongoing project involvements, forming under a specific company to address these issues was needed. All advisors and consultants are highly vetted at CTE and we are on the look-out for experienced and talented individuals to become involved. We’ve been in crypto-currency since the very first alt-coins and invested in the first ICO’s on Bitcointalk.org. Our passion is investing, trading and understanding the technology that’s defining all our futures. In total, T.k. Hamed has invested hundreds of hours on a weekly basis (researching, advising clients and etc.) and over the past 5-years, gained tens-of-thousands of hours of crypto-experiences. These unique experiences are specific to crypto, from development to community reception, SEM marketing and many other factors pertaining to what it takes to be a successful crypto. Since many questions arise about “What was Coins Source” and what was accomplished, I’ve found a former update and compiled all that information below (the graphics). This will serve as some insight into what exactly Coins Source was and how it changed the crypto sphere. Several: ideas, innovations and concepts that we have come to accept today, in one form or another, originated from the central idea of what Coins Source represented. The official post can be found here. This part is merely an explanation of some of our previous experience, evidence that what’s ultimately claimed by ICO Advisor’s of CTE Advisor can be substantiated. Coins Source was the first and largest alternative-coin specific website and at its height, had over 3,000 daily unique-users accessing the site (in 2014-2015) when crypto markets were 1/20 the size they are today. 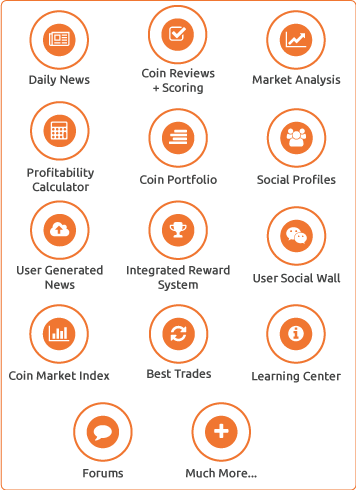 You can review the Twitter account for Coins Source, to get a better understanding. One of the many major achievements of Coins Source was the creation of the first KYC process specific to coin developers, called Trust Index. Trust Index helped pave the path for greater transparency among developers. We actively verified over 75+ coin launches and developers at our height, and later launched Proof-of-honor — a community vote for “the best developer of the year.”A major success (POH Thread). 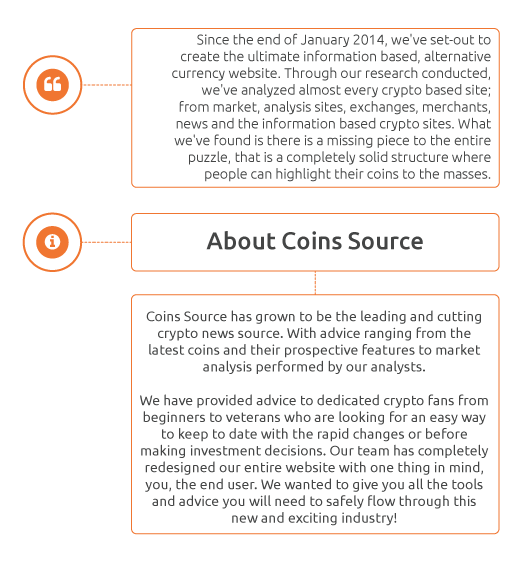 Coins Source featured: the latest coin articles, newest crypto launches, coin reviews, market analysis, market information, crypto-guides, mining guides and several other miscellaneous information specifics to alternative coins, during a different era in crypto. Coins Source was the first crypto company that presented in-depth coin reviews and coin rankings. There were many achievements and innovations that were accomplished with Coins Source and the innovations and ideas founded with Coins Source still reverberate through the entire crypto world today. We were ultimately known throughout the crypto-space by promoting/acknowledging and being involved hands-on with many of the top 20-coins today, such as Monero, Dash, NEM and Stellar, and the most prestigious U.S.-Based exchanges at the time: Poloniex & Bittrex.